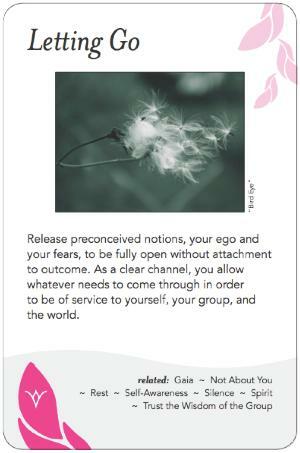 Release preconceived notions, your ego and your fears, to be fully open without attachment to outcome. As a clear channel, you allow whatever needs to come through in order to be of service to yourself, your group, and the world. this is the supreme virtue." How counter this is to our conditioning as individuals in the United States today! The whole model of leadership for Americans is one of controlling a pyramid from the top down. Where we are taught to put our own needs first, other cultures are more attuned to the needs of the collective. The broader cultural shift in that direction is sometimes referred to as moving from a dominance to a partnership society, or from "power-over" to "power with." Anyway, getting back to a practical basis as regards this pattern for group work, if you are facilitating a group conversation and you get stuck imposing your viewpoint on the group, subtly steering the conversation toward your personal preference, or worrying about your performance, it's going to get in the way of effectively serving the group. If that happens, you need to find a way to restore your focus to the needs of the whole. It can be as simple as realizing what you've done and letting it go, or you might invoke a personal practice (see below), ask for a moment of silence, or share with the group transparently what just came up for you. These practices are commonly done as part of a daily or weekly routine. In addition, many people choose to do a session specifically as a prelude to a group event, before acting in a leadership position. (Such preludes may be shorter than a regular full-length practice.) As the name implies, a personal practice is normally done alone, or (as in the case of counseling) with someone whose role is to support the person in getting clear. Some groups also have a collective equivalent, such as the reading of a mission statement or ground rules, as part of an Opening and Welcome that fulfills a similar purpose. Whatever the specifics, the goal here is to get beyond one's own needs, preferences, and ego, so as to be of service to the larger whole. The Religious Society of Friends, better known as the Quakers, emphasize the importance of being a Clear Channel for everyone in their "Meetings for Worship for Business," not just the "clerks" (facilitators). Note that Meetings are typically open for attendance by anyone, not just the members. Tao Te Ching, by Lao Tzu, c. 500 years BCE. Many versions available, my personal favorite is by Stephen Mitchell (Harper Perennial, 1988). Standing in the Fire, by Larry Dressler, is all about finding the groundedness to serve the group clearly. Among the many excellent texts available on group facilitation, The Art of Facilitation by Hunter, Bailey and Taylor particularly emphasizes the importance of working on yourself in order to do this work successfully.